WATERFORD CITY: 40 Pied Wagtails roosting in plane tree opposite the Tower Hotel. WATERFORD CITY: Swallows seen today. DUNGARVAN: Red-necked Grebe close inshore at Ballynacourty pier. BALLYSCANLAN WOOD: Partial albinistic Blackbird. DUNGARVAN: 4 Brambling in town, Common Sandpiper (early arrival?) at Barnawee. DUNGARVAN: Slavonian Grebe off Ballynacourty, 2 Sandwich Terns off the pitch & putt course. 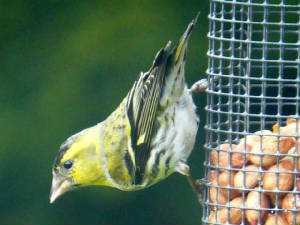 WATERFORD CITY: A Snow Bunting joined a flock of finches & Reed Buntings in a garden at St John's Park today. BALLYRAFTER WOODS, LISMORE: Crossbills here all week. 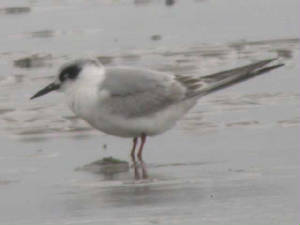 TRAMORE BACKSTRAND: An early Sandwich Tern at Saleen. ANNESTOWN: Scandinavian Rock Pipit (littoralis subspecies). DUNGARVAN: Black Redstart along old railway line at Barnawee. CARRIGANORE: 20+ Snipe on bank of River Suir. DUNGARVAN: 5 Brambling in town. DUNGARVAN: 1st-winter Forster's Tern still present off Barnaweee, Red-necked Grebe off Ballynacourty pier, 4 Brambling in town. BROWNSTOWN HEAD: Whimbrel (early migrant?). DUNGARVAN: 1st-winter Forster's Tern off Abbeyside/Barnawee; 3 Bramblings in town. 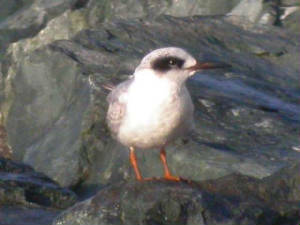 DUNGARVAN: 1st-winter Forster's Tern, Slavonian Grebe & Red-necked Grebe off the Gold Coast (Ballynacourty pier); an early Wheatear at Abbeyside beach. WATERFORD CITY: 4 Waxwings, St John's Park. KILMEADEN POOLS: 2 Water Pipits (just beginning to moult) and a Water Rail. WATERFORD CITY: 5 Waxwings, St John's Park. Nr TRAMORE BACKSTRAND: 2 Yellowhammers on road. 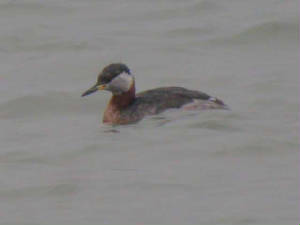 DUNGARVAN: Slavonian Grebe still present off Ballynacourty pier, also an early Swallow & 2 Black Guillemots there. CLONEA/BALLINARD: 14 Red-throated & 9 Great Northern Divers; Whimbrel & Black Redstart at Ballinard. BALLYVOONEY COVE: 4 Red-throated & 3 Great Northern Divers, 2 Black Guillemots. BUNMAHON: 5 Red-throated & 2 Great Northern Divers. WATERFORD CITY: 7 or 8 Waxwings in Cleaboy area. 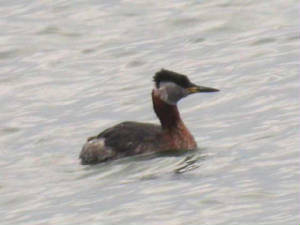 DUNGARVAN: Slavonian Grebe, apparently the first record here since the 1999/2000 winter. RIVER BRICKEY (Two-mile Bridge to Knockmaon Bridge), nr Dungarvan: 3 Kingfishers, a Dipper & a Jay. WATERFORD CITY: c.40 Waxwings at the Cork Road. Nr TRAMORE BACKSTRAND: Red Kite still present (further east from original Pickardstown location). BALLYSHUNNOCK RESERVOIR: 14 Whooper Swans. LITTLE ISLAND: 2 Little Egrets, 18 Grey Herons, 61 Wigeon, 190 Dunlin, 2 Jack Snipe & a Kingfisher. TRAMORE BOATING LAKE: 62 Brent Geese. BLACKWATER CALLOWS: Common Sandpiper at Ballyduff, & 185 Whooper Swans, 15 Mute Swans, 500+ Wigeon, 60 Teal, 2 male Shoveler & a Little Egret between Lismore & Ballyduff. BUTLERSTOWN, nr Waterford city: Female Brambling for 3-4 weeks, also 4+ Siskins recently and a pair of Blackcaps over last few months. WEST WATERFORD: Barn Owl seen recently in the Blackwater area. 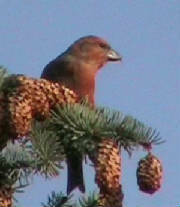 DUNGARVAN: 7-10 Crossbills at Gold Coast golf course, 4 Bramblings in town. DUNGARVAN (I-WeBS count): Totals included 41 Great Crested Grebes, a Red-necked Grebe, 2 Red-throated divers, 824 light-bellied Brent Geese, adult dark-bellied Brent, adult Black Brant, & a 1st-winter Little Gull. CLONEA STRAND/BALLYNACOURTY POINT: 5 Red-throated Divers, Great Northern Diver, 100 light-bellied Brent, adult dark-bellied Brent, also 2 Common Seals off Ballinard. BALLYVOONY COVE: 6 Red-throated Divers, 6+ Bottle-nosed Dolphins. BALLYDWAN: 4 Red-throated & 6 Great Northern Divers. BALLYSHUNNOCK RESERVOIR: 2 Whooper Swans, 7 Crossbills. 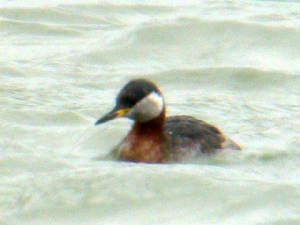 TRAMORE BAY: 9 Common Scoters, single Red-throated & Great Northern Divers. LISMORE/BLACKWATER area: Crossbills still widespread, including sightings at Ballyrafter Woods (Lismore), Ballyduff town and near Tallow, also the Vee along Waterford/Tipperary border. Also in Lismore area, a male Hen Harrier in in mid Feb, and Jays regular. 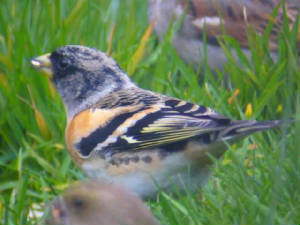 DUNGARVAN town: Male & female Brambling. COOLFIN/DERRIGAL: 273 Greylag Geese & a Pink-footed Goose at Derrigal cross-roads. KNOCKADERRY RESERVOIR: 4 Whooper Swans, 23 Tufted Duck. WATERFORD CITY: Crossbill at Lower Grace Dieu. 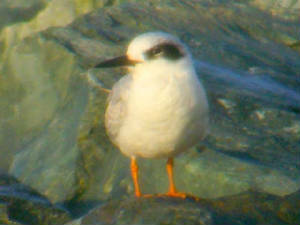 CLONEA STRAND: Chiffchaff & 1st-winter Mediterranean Gull, Ballinclamper. BALLINARD: (Ballynacourty Pt): Black Redstart. DUNGARVAN/HELVICK: Red-necked Grebe in outer bay, Green Sandpiper & Chiffchaff at Brickey river. BALLYQUIN (nr Ardmore): Red-throated Diver, 116 Oystercatcher & 39 Sanderling. ARDMORE BAY: 5 Red-throated Divers, Great Crested Grebe, 1300 Common Gulls & a 2nd-winter Mediterranean Gull. WHITING BAY: 2 Little Egrets, 6 Brent Geese, 157 Oystercatcher, 40 Sanderling, 200+ Woodpigeons & 15 Choughs. CALISO BAY: 3 Red-throated Divers. DUNGARVAN: 4 Goosanders (male, female & 2 immatures) at Ballyneety bridge. DUNGARVAN: Red-necked Grebe between Ballynagaul & Helvick, female Goosander at Ballyneety, Chiffchaff at Knockanpower (Ring), 3 Brambling & 30 Siskin in town. WATERFORD CITY: 5 or 6 Reed Buntings feeding in a garden in St Herblain Park. KILMEADEN POOLS: Water Pipit & Water Rail. BALLYSHUNNOCK RESERVOIR: Female or imm Hen Harrier, Whooper Swan & Chiffchaff. 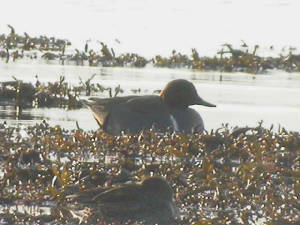 CLONEA STRAND: 2 Purple Sandpipers at Ballinclamper. DUNGARVAN/CLONEA: 4 Brambling along railway track between Barnawee and Clonea road. WATERFORD CITY: Several recent reports of a Barn Owl. CLONEA: 4+ Brambling, among good numbers of other finches, along the old railway track, also 2 Stock Doves. Last updated updated 8 March 2006. DUNGARVAN: 3+ Bramblings along railway track near Barnawee. KNOCKMEALDOWN MOUNTAINS: Fresh droppings of Red Grouse found (near Waterford/Tipperary border). FIDDOWN/TIBBERAGHNY: 59 Whooper Swans (on Kilkenny side), 4 Little Egrets, 179+ Teal, 40 Redshank & 2 Greenshank. COOLFIN/DERRIGAL: 70 Greylag Geese & a Little Egret near Derrigal cross, 2 Green Sandpipers & a Kingfisher at Clodiagh bridge. BALLYSHUNNOCK RESERVOIR: Great Crested Grebe, 4 Whooper Swans & a male Crossbill. KNOCKADERRY RESERVOIR: 246 Mallard, 4 Shoveler & 36 Tufted Duck. KILMEADEN POOLS: 2 Shoveler & a Green Sandpiper. LITTLE ISLAND: 2 Common Sandpipers near the ferry crossing. BLACKWATER CALLOWS: Ruff at Lismore, Green Sandpiper at Ballyduff. BALLYLEMON, CAPPAGH: Male & female Blackcap. DUNGARVAN: Male Goosander opposite the Mart at Ballyneety. TRAMORE BOATING LAKE: 120 Brent Geese. DUNGARVAN (I-WeBS count): Totals included 5 Red-throated Divers, 47 Great Crested Grebes, 1009 pale-bellied Brent Geese, plus an adult dark-belled Brent and adult Black Brant (latter two at pitch & putt course). CLONEA STRAND: 3 Great Northern Divers, 1 Red-throated Diver, 19 Sanderling, 70 pale-bellied Brent Geese & an adult dark-belled Brent. 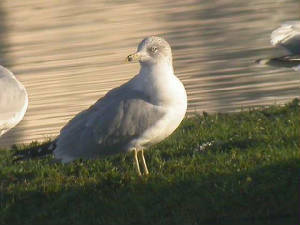 TRAMORE BOATING LAKE: Adult Ring-billed Gull & 70 Brent Geese. DUNGARVAN: Black Brant, male Green-winged Teal & female Pintail off the Sports Centre; Chiffchaff at Knockanpower Lower, Ring. COOLFIN/DERRIGAL: Pink-footed Goose & 289 Greylag Geese at Derrigal cross-roads. PICKARDSTOWN: Water Rail & c.50 Siskins. WATERFORD CITY: Jay at De La Salle College, Newtown. WATERFORD HARBOUR (CHEEKPOINT TO CREADAN HEAD) (I-WeBS count): Totals included 36 Great Crested Grebes, 146 Cormorants, 10 Little Egrets , 49 Brent Geese, 50 Shelduck, 93 Wigeon, 2173 Lapwing, 1296 Oystercatcher, 391 Black-tailed Godwit & 34 Sanderling (full details); also 2 Otters swimming off Passage East. TRAMORE BACKSTRAND: 733 Brent Geese. KILMEADEN POOLS: 2 Water Pipits still present, also 3 Shoveler, 2 Water Rail, Green Sandpiper & 2 Choughs. KNOCKADERRY RESERVOIR: Red-necked Grebe, 3 Whooper Swans, 37 Tufted Duck & 38 Pochard. PICKARDSTOWN (Tramore road): Wing-tagged Red Kite still present. 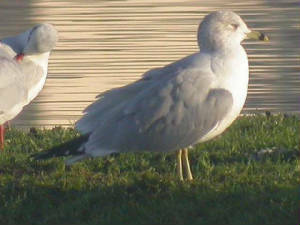 TRAMORE BOATING LAKE: Adult Ring-billed Gull & adult Mediterranean Gull (latter a ringed bird). PASSAGE EAST: Adult Glaucous Gull & 2 adult Mediterranean Gulls. WOODSTOWN: Adult Iceland Gull & 6+ adult Mediterranean Gulls. PICKARDSTOWN (Tramore road): Wing-tagged Red Kite still present - apparently a bird fledged from the reintroduced population in N Scotland in 2005 (details to be confirmed). BUNMAHON: 2 male Common Scoters. BALLYVOONEY COVE: 4 female Common Scoters. Near WATERFORD CITY: Carrion Crow at Brockton Drive, Blackthorn Hill [Co Kilkenny? ], near the golf course. BLACKWATER & BRIDE RIVERS: Total count of 493 Whooper Swans (mainly Co Waterford). PICKARDSTOWN (Tramore road): Red Kite just north of the conifer plantation here - present since Christmas day; bird has two wing-tags (no further details yet). TRAMORE BACKSTRAND (I-WeBS count): Totals included 11 Little Egrets, 883 Brent Geese, 48 Shelduck, 108 Wigeon, 520 Oystercatchers, c.4000 Golden Plover, 245 Grey Plover, 210 Knot, 48 Sanderling, 697 Dunlin, 105 Snipe, 343 Black-tailed Godwit, 247 Bar-tailed Godwit, 351 Redshank (full details), also an adult Ring-billed Gull at the Boating Lake. TRAMORE BAY (outer): 10 Red-throated Divers, 1 Great Northern Diver & 22 Common Scoter. VEE GAP [Co Tipperary]: Male Hen Harrier & c.30 Crossbills. WATERFORD CITY: Female Blackcap, Earlscourt, and male Blackcap at Collin's Avenue - also up to 15 Collared Doves in garden there, recently. Nr TRAMORE BACKSTRAND: 6+ Yellowhammers. HELVICK HEAD: 5 Red-throated Divers. DUNGARVAN: Black-throated Diver in the bay; 2 dark-bellied Brent Geese, Black Brant, Pintail & female Goosander by the sports centre; 2 Goosanders & a Kingfisher at Ballyneety; another Kingfisher at the Brickey river; Whimbrel & Chiffchaff at Knockanpower Lower (Ring); also Chiffchaff at Killongford. GILES'S QUAY, nr Waterford city: Little Egret, 2 Greenshank, 2 Turnstone & a Common Sandpiper. HELVICK HEAD: A Great Skua flew west. DUNGARVAN: 84 Great Crested Grebes, 5 Red-throated & 2 Great Northern Divers; 3 Chiffchaffs at Knockanpower Lower (Ring). DUNGARVAN: 2 Goosanders (male & female) at Ballyneety, 4 or 5 Bramblings at the dump, a female Shoveler off the sports centre & a Green Sandpiper along the Brickey River at Two Mile bridge. CLONEA STRAND: Whimbrel at Ballinclamper.